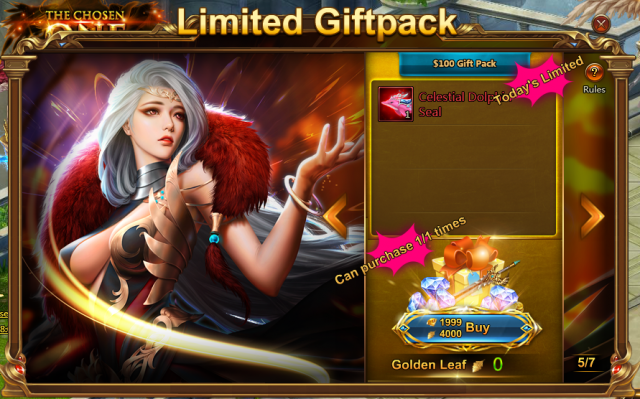 League of Angels II opens a new special event: Limited Giftpack. In this event, players can collect their beloved items at a very big discount! - Click the “Limited Giftpack” button on the left of the game screen to open the event panel. - During the event, players can get Golden Leaves which will automatically appear in the Limited Giftpack event panel after each recharge. 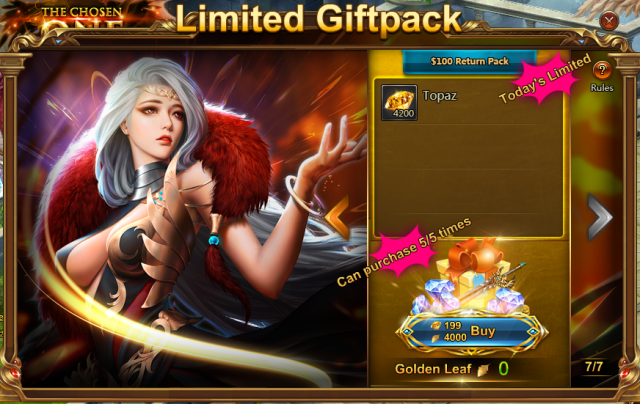 Recharge one Topaz to get one Golden Leaf, and the Golden Leaf will be reset at 0:00 (server time)everyday. - Players can spend the Golden Leaf and Topaz to buy their beloved items. - There are three types limited purchase time(daily, weekly and monthly) and different items have different limited purchase time. Now Limited Giftpack is available on Loa 2.Check it out in game! Do not miss this great chance to collect your beloved items. Last：New Event First Purchase Chest: Get Angel’s Treasure Timely! Next：New Event Destiny Wheel: Chance to Earn Free Topaz!